Winter finally arrived after a surprisingly warm December, but the days are already getting longer – a reminder that we can look forward to spring. Get ready to enjoy nature in 2016 by taking the Nature Notes quiz from the 2015 columns and refreshing your knowledge of local wild plants, animals, and more. Take the quiz by looking at the short descriptions below of wild plants, animals, and more featured in Nature Notes in 2015. Then match the descriptions with the names in the alphabetical list that follows. Choose your answers from the drop down lists. Check your answers by clicking the "Show Answers" button. The answer page will contain links to the relevant 2015 “Nature Notes” columns in case you’d like to read any of last year’s columns, or any others among more than 220 past columns. 2. I’m that black bird that you see perching silently on tree branches, logs, stumps, or other objects out in the middle of ponds, especially in spring and fall. 3. You might think I’m a strange pinecone or old corncob, but I’m a parasitic plant that grows on underground oak tree roots. 4. 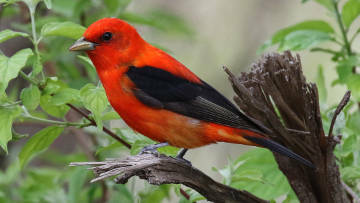 I’m a bright red bird that comes to New England to breed in forests, and I sing a raspy song while my green mate blends in with the foliage. 5. Listen for my lovely flute-like song in the woods – one of the special sounds of summer. 6. 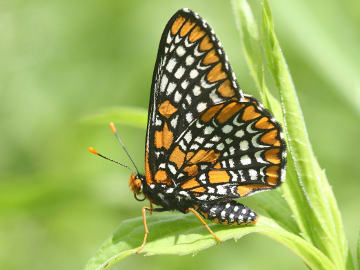 Like some other butterflies, my colors are orange, black, and white, but my checkerboard pattern is distinctive. 7. My caterpillars probably ate all the leaves off some of your trees, and they’re likely to do it again this coming spring. 8. I’m a summer bird of the forest floor, with a loud repetitive song, and I’m named for my dome-shaped nest which resembles something the early colonists used for cooking outdoors. 9. 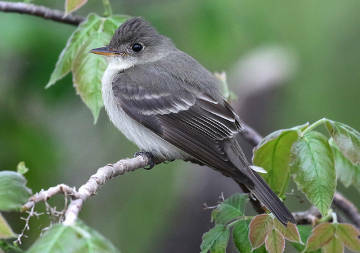 I’m a gray flycatcher with a name that sounds like my song, which you might, still hear in late summer and fall when many other birds have gone silent or already gone away. 10. As an invasive giant reed, I’m hard to miss in local wetlands, and surprisingly, I’m a host plant for a small native butterfly, the broad-winged skipper. 11. Saplings are still sprouting from my roots, even though I’m long gone due to a blight that ravaged eastern forests more than a century ago. 12. I’m a lacy fern that stays green all winter in our local woods, thanks to sugars and proteins that act like antifreeze inside me. 13. You might notice a ring on my bill, but I’m a diving duck named for a ring that’s hard to see on a different part of my body. 14. I eat about 4 mice per day, and my mate and I and our three chicks eat 9,800 mice per year, so we do a much better job of controlling rodent pests than any poison you might use!